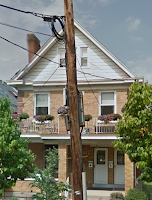 The house at 1240 Rosemont Avenue in Cincinnati was right next door to the house Catherine grew up in, still owned by her parents Michael and Mayme Crusham. This was a godsend for Catherine with a toddler and a new baby to take care of on her own. Catherine had a family picture taken to send to Roy; he would not get to meet his daughter, Kathleen, until she was seventeen months old. After the surrender of the Japanese on 15 August 1945, troops in the CBI Theater began to demobilize. The order that released Roy from service was dated 1 October 1945. Soldiers were furloughed home according to the number of points they had accumulated under the Advanced Service Rating Points System. The points were awarded as follows: 1 point for each month served in the Army, 1 point for each month served overseas, 5 points for each campaign star worn on theater ribbons, 5 points for the first and each award received (such as Distinguished Service Cross), and 12 points for each child at home under 18 years of age (up to 3 children). Points were awarded for months served between 16 September 1940 and 12 May 1945. Originally a soldier was required to have 85 points in order to go home. The number was lowered as demobilization continued. On 1 November 1945 the military began to release soldiers who had 60 points. By the time Roy was released, he had 90 points. He was a little peeved about the change, considering what he had gone through to obtain his point total. The India-Burma-Theater Roundup Vol. IV No.7 issued 15 October 1945 indicated that according to the War Department there were still 5,000 soldiers in the India-Burma-China Theater with 85 or more points in October of 1945. 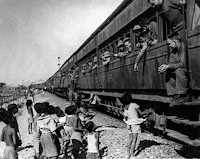 According to the same issue of the Roundup, the allotment of planes from Chabua and Calcutta to Karachi in October of 1945 carried 700 men per day, and 10 trains transported troops that month from Assam to Karachi. With 500 troops being flown from Assam to Karachi and 200 from Calcutta to Karachi each day, only one troop train every third day was used in the evacuation of troops from Assam and Burma. Two types of troopships were used in evacuating India-Burma: 3,000 and 5,000 capacity ships. Seventeen ships handled troop movements from Calcutta and Karachi during September and October. 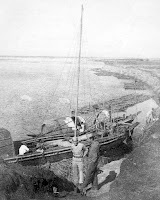 Ships leaving Calcutta reached the East Coast of the United States in 26 days, while those leaving Karachi made the voyage in 21 days. Four troopships - the Taylor, Anderson, Eltinge and Patrick - sailed during the week ending October 24, which was the week Roy began his voyage home. A total of 14,500 troops were evacuated on these ships, bringing the combined strength of the India-Burma and China Theaters down to 170,000. 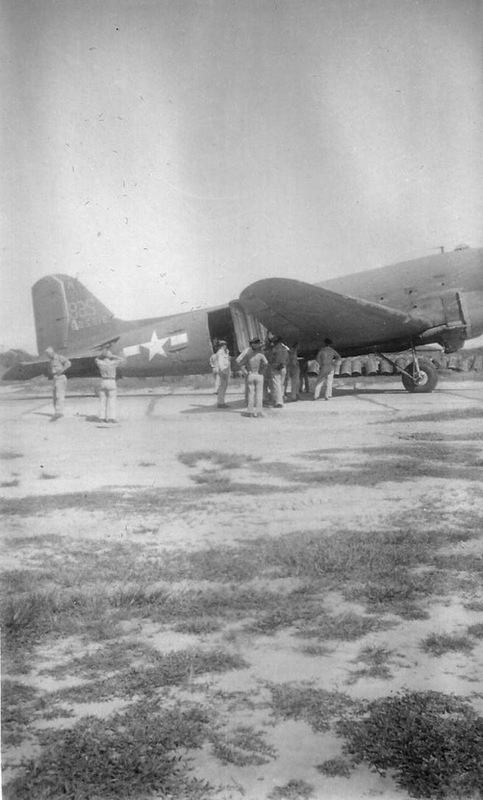 Roy remained at the Chabua Air Base until October 1945, when he flew on a C-47 to Agra, New Delhi, Jorhat, and finally Karachi. It is unknown how long Roy spent in Karachi before boarding his ship. According to the War Department, the men would remain in the staging area at the ports of embarkation anywhere from seven to twenty-one days. At this time they would receive medical checkups and processing. By strange coincidence, on 21 October 1945 Roy again boarded the USS General A.E. Anderson (AP-111) for the trip home. 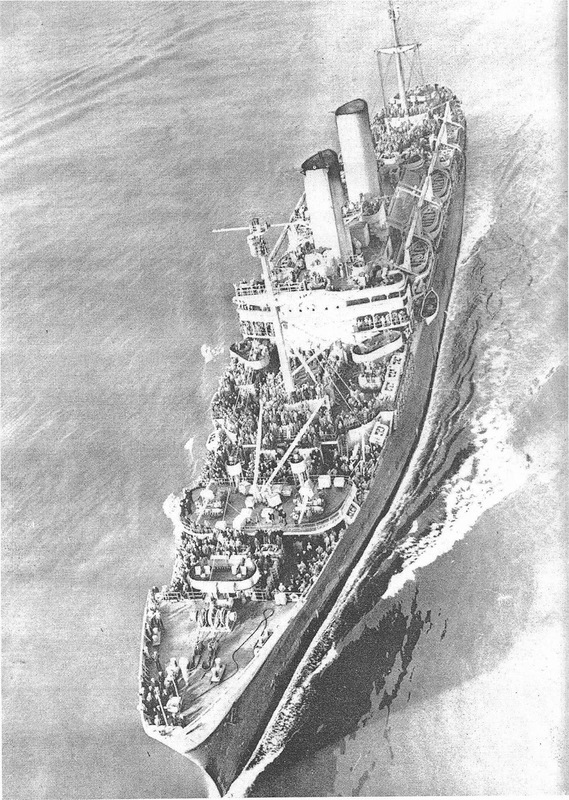 This was cruise number thirteen for the USS General A.E. Anderson, and the ship was captained by George Whitefield Mead, Jr. The ship arrived in New York City on 9 November 1945, sailing past the Statue of Liberty, much to the delight of all the servicemen. While Catherine was settling into her life with a two year old and newborn, Roy was adjusting to life in India. Beginning in 1942, India served as the base for all Army Air Forces operations against the enemy in Burma, providing aid to China. Following the ship’s arrival in Bombay on August 7, 1944, Roy was stationed at Camp Worli, a British Royal Air Force transit camp located just north of Bombay, for two to three weeks. 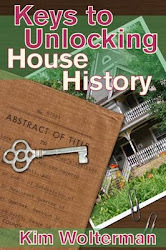 The buildings were made of brick with no glass in the windows or doors in the door frames. After the confines of the ship, the camp seemed like a motel to Roy. He had a whole bed to himself, even though it was made of wood and roping. The soldiers received mosquito nets and sundry clothing. 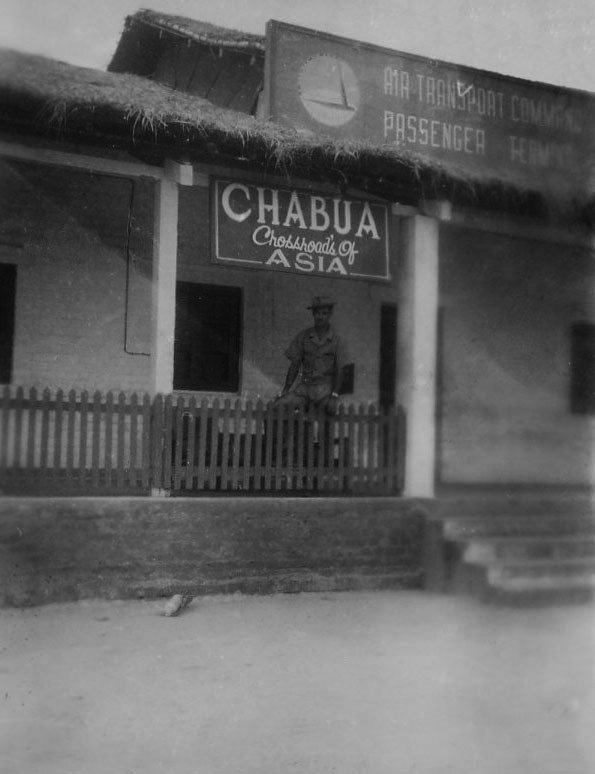 Following his stay at Camp Worli, Roy boarded a train across India to Camshupora, located just outside of Calcutta. This train ride would probably have taken about three days. From there they took another train to the Brahmaputra River. 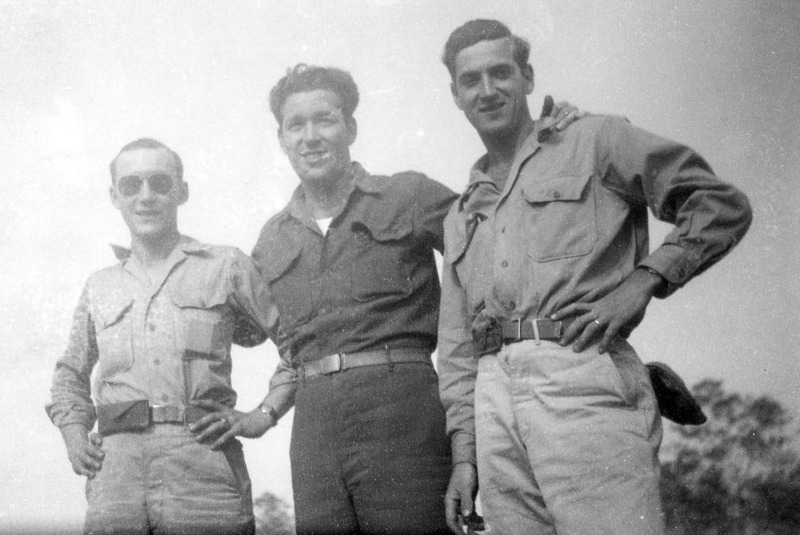 On this leg of the journey, Merrill’s Marauders were on the train with them and Roy was able to meet some of the men. One of the things that amazed Roy about the trains was that the track was laid by different groups of people, so they weren’t built to the same gauge. Apparently the Army Transport Command had purchased the railroads from several small railroad companies, who had used different track gauges when they originally built the tracks. The track would simply end and they would have to change trains. Because of this, a trip that could have been accomplished in one day ended up taking several. However, Roy said the scenery was beautiful on the trip. Once they arrived at the Brahmaputra River they took a riverboat to Jorhat, India. The western flank of the Brahmaputra River is big-game country with tigers, wild elephants, and herds of rhinoceros. Jorhat had one of the largest airstrips in northeastern Assam. It was at Jorhat that Roy was trained to become a loading supervisor, and he learned how to convert B-24s to C-109s. Loading operations were under the supervision of qualified enlisted air transportation technicians. Roy’s Military Occupation Specialty (MOS) was Air Transportation Technician. Roy served in the 1333rd Army Air Forces Base Unit, Army Transport Command. Air Transport Command (ATC) was established in 1942 as a unit of the U.S. Army Air Forces. Previously named the Air Ferrying Command, its mission was to meet the urgent demand for the speedy reinforcement of the U.S. military bases worldwide during WWII, using an air supply system to supplement surface transportation. ATC also operated a worldwide transportation system for military personnel. 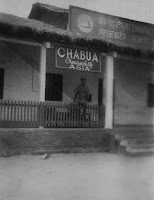 One of diversions on the Chabua base was the Bamboo Music Hall. Roy had always enjoyed music and entertainment, so he likely passed quite a bit of his free time here. Stars of many USO shows appeared in this hall, such as Joe E. Brown, Noël Coward, and Paulette Goddard. From late October through early December 1944, Pat O’Brien, Jinx Falkenburg, Harry Brown, Betty Yeaton, Jimmie Dodd, and Ruth Carrell Dodd performed more than a hundred shows in the China-Burma-India (CBI) Theater. Dixie Walker and his troupe, made up of major league baseball players, also entertained. What a thrill that must have been for the men on the base to be able to have a taste of home in India! 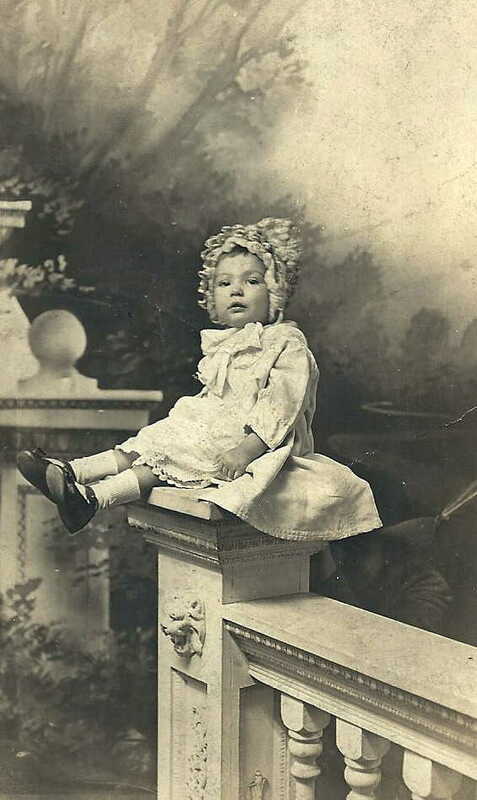 Once baby LeRoy gained a sufficient amount of weight, he and Catherine were able to travel by train to St. Louis, where they set up their household on the south side of town. The house was located in Lemay on Perrin Avenue, close to Notre Dame High School and Jefferson Barracks. Once a single-family home, this house had been converted to a rooming house to meet the needs of soldiers and their families. The Kublers made the most of their time in St. Louis, enjoying Forest Park and the zoo, among other attractions. 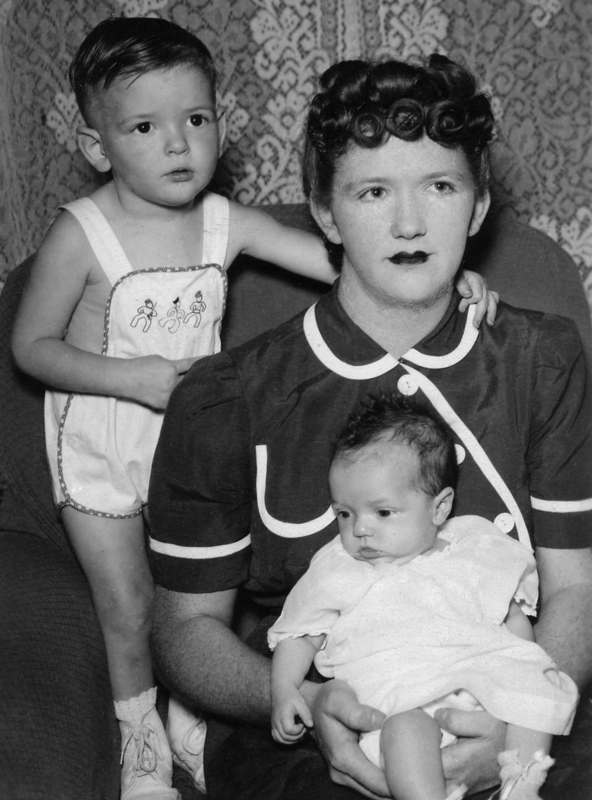 By October of 1943, Catherine was expecting a second child and received medical care at St. Louis University Hospital. Coincidentally her brother-in-law Kevin McGann, who was married to Roy’s sister Jane, was training as a family practice resident at St. Louis University. Catherine always requested not to be seen by Kevin. She thought it was a little too personal to share that kind of exam with Kevin! In May of 1944, Roy was given his orders to report to Greensboro, North Carolina to prepare for overseas training. 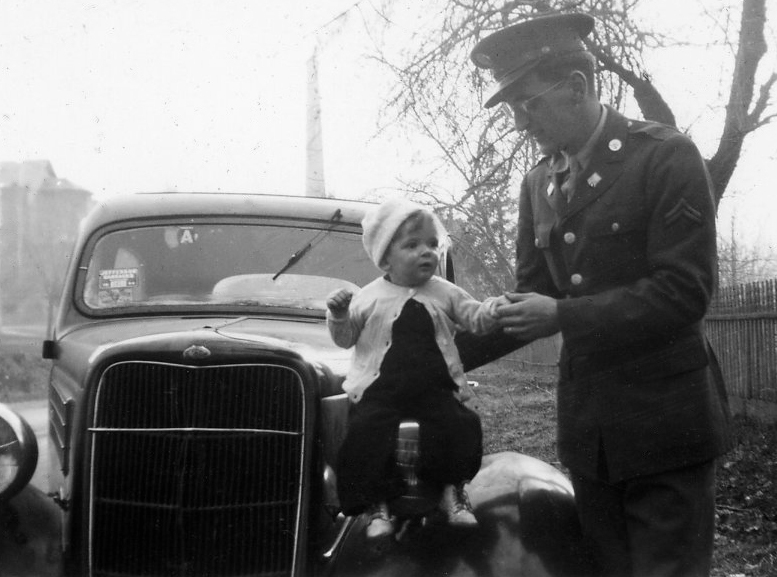 At this time the family had a car, so Roy drove Catherine and LeRoy back to Cincinnati. Most of the trip was made during the night. With the rationing of gas and tires, the long road trip found Roy patching and borrowing tires along the way due to frequent blowouts. At one point, the car was making a funny noise. As Catherine drove, Roy stood outside on the running board listening to the engine. Little LeRoy stood on the seat saying, “Bye-bye, Daddy. Bye-bye, Daddy.” Catherine thought he was waving to his daddy out the window. A few miles passed before she realized Roy was no longer on the running board but had fallen off. It probably was a pretty quiet drive back to Cincinnati after that. Catherine and LeRoy moved in with her parents, Michael and Mayme Crusham (who still had five children living at home! ), and Roy headed off to Greensboro. During his overseas training at the Eastern Overseas Replacement Depot in Greensboro, Roy’s daughter, Kathleen Mary, was born in Cincinnati. He was not given any leave time. Upon completion of his training later in June, he was sent to Norfolk, Virginia to ship out. In late June, Roy boarded the USS General A.E. Anderson (AP-111), captained by William Miller. On 29 June 1944, his twenty-seventh birthday, the ship left port headed for Bombay, India. While on the ship Roy quickly learned that the food available to the troops was not that good. With his experience in cooking at Jefferson Barracks, he arranged to help out in the kitchen on the ship. He received much better food and was able to get to know the officers on the ship. The USS Anderson passed through the Panama Canal on the 4th of July, and crossed the Equator on July 8th and the International Date Line on the 18th. It made a brief two day stop in Melbourne, Australia before arriving in Bombay on 7 August 1944. 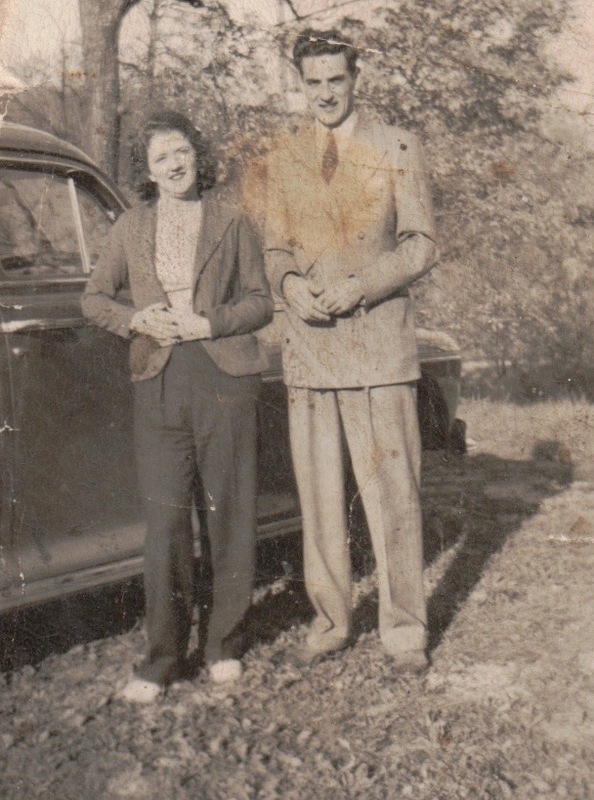 Roy and Catherine tried to settle into their new lives living with Roy's parents, Joseph and Lillian (Hungler) Kubler following their 17 January 1942 wedding. 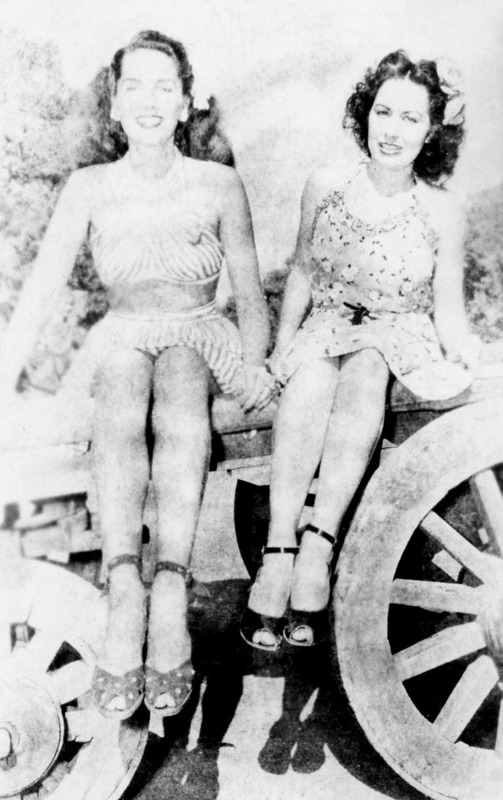 While Roy's older sister Ethel was married and living elsewhere at the time, his younger sisters Jane and Gloria were still living at home. But a new reality came crashing in on 30 January when Roy received his Notice of Classification from the government. Listed as a Class I-A, he was certified as available and fit for general military service. Things moved quickly after that. 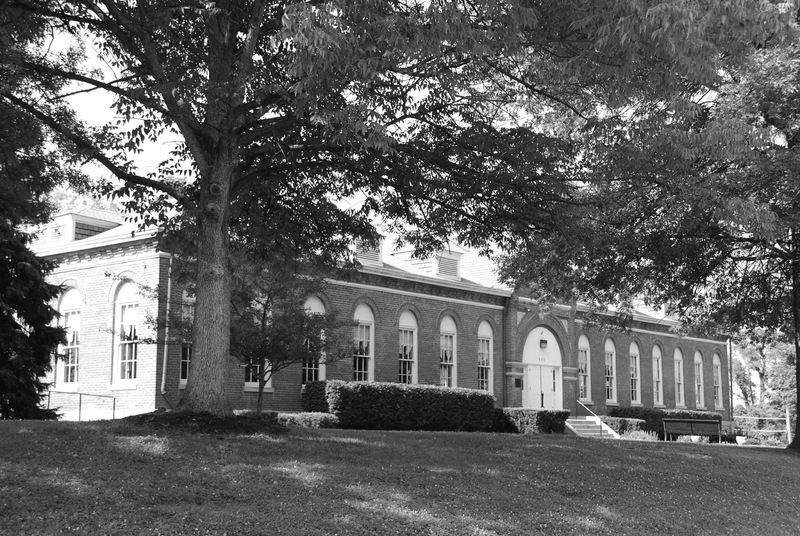 Roy was ordered to report for his physical at 7:00 a.m. on 6 February 1942 at Carson School on Glenway Avenue. Upon passing the test and the physical, he knew it was now only a question of time before he would be ordered to report for duty. He was willing to serve his country, and he elected to go into the U.S. Army Air Forces, the predecessor of the U.S. Air Force. He then awaited orders to proceed to a Reception Center, where he would complete records, be issued individual equipment, be given immunizations for smallpox and typhoid, and then be forwarded to a tactical unit or other installation. In the meantime, he received a Notice of Continuation of Classification. 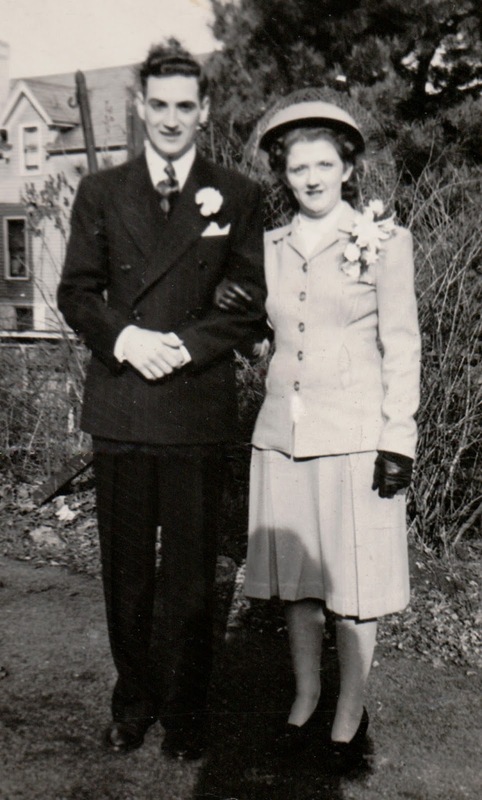 Two months into their marriage, Roy received orders to report to nearby Fort Thomas, Kentucky, leaving his new bride behind in the household of her in-laws at 1007 Regina Avenue. Located about 6 miles south of Cincinnati, Fort Thomas was established as a military base in 1890, and was reactivated in 1941 as an Army reception and induction center for WWII. Following a short stay at Fort Thomas, Roy was sent by train to Jefferson Barracks in St. Louis to begin his military training. It was here that he learned how to march, shoot, pitch a tent, make a bed (military-style), offer basic first aid, read a map, and defend himself against chemical attacks. He also learned that he was to become a father! Beginning as a private with an occupation of Basic Infantry, Roy was promoted after two months to private first class. On September 19, 1942 Captain George Weber, the commanding officer, promoted Roy to corporal. During this time period Roy was a cook at Jefferson Barracks. His mother's cooking instructions paid off for him. With a baby on the way, for extra money he would operate the movie projector at the base on the weekends. In late September, Roy received a Western Union telegram from his mother notifying him of the birth of his son. LeRoy Charles Kubler was born prematurely on 29 September, weighing just 4 pounds, 4 ounces. Note: I am behind on the Family History Writing Challenge as I was out of town for four days creating new family history memories. My in-laws celebrated their 65th wedding anniversary, and it was important to focus on the family during that time period. 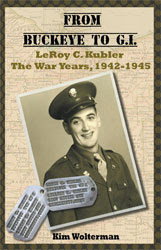 The second child born to Joseph and Lillian (Hungler) Kubler was LeRoy. As he is my father and I want to end this writing challenge with him, I will skip over him and talk instead about Mary Jane, the third child, of the Kublers. 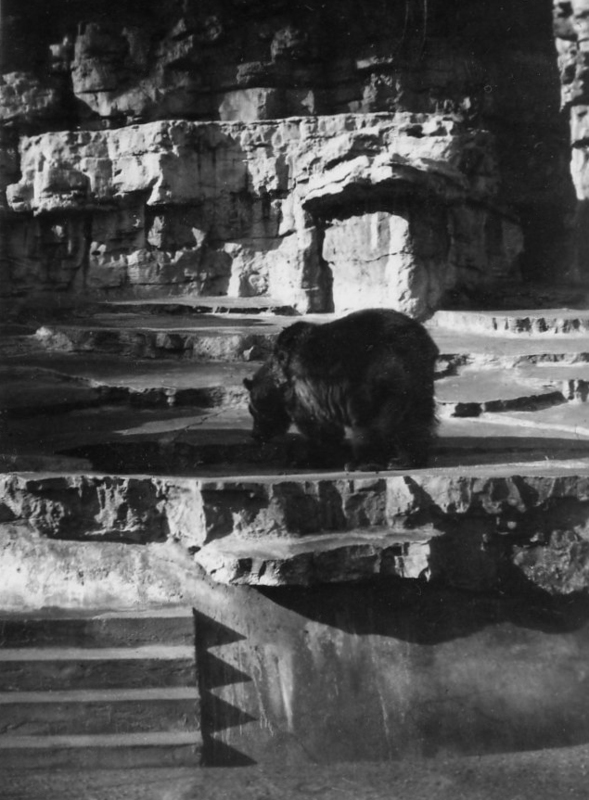 Jane, as she was called, was born on 10 April 1925 in Cincinnati. Her sister Ethel was 11, and her brother LeRoy was 7 when she joined the family. She attended Seton High School, a Sisters of Charity Catholic girls school in Cincinnati. There she participated in Troupe No. 371, Seton Unit of the National Thespian Dramatic Honor Society. 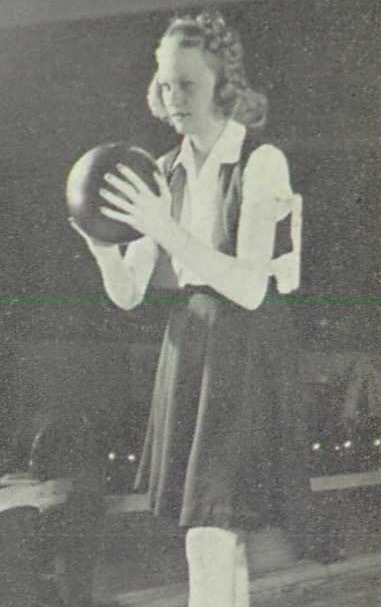 Jane was also an avid bowler. At the age of 18, Jane married 19-year-old Kevin McGann. They exchanged vows on 26 November 1943, which was the day after Thanksgiving. Kevin had graduated from Elder High School, an all boys Catholic school, where he was active on the tennis team. From there he attended Xavier University in Cincinnati, and then St. Louis University, where he graduated from medical school. Kevin served in the US Navy and US Air Force during WWII. Their daughter Sharon was born in St. Louis. Sons Kevin, Michael and Timothy were born in Cincinnati, and daughters Colleen and Kelly were born in Georgetown, Ohio where Kevin established his office as a physician. He practiced there for 38 years, delivering over 2,000 babies. He also served as the Health Commissioner for Brown County, Ohio for more than 30 years. Kevin died on 4 March 2013, just one day shy of his 89th birthday. He and Jane had been married for 69 years. His funeral was held at St. George Catholic Church, where the family were long-time members. Jane did not live long without him, passing on 2 October 2013 at the age of 88. She was with her oldest daughter and son-in-law in New York when she died, and that is where a service for her was held. 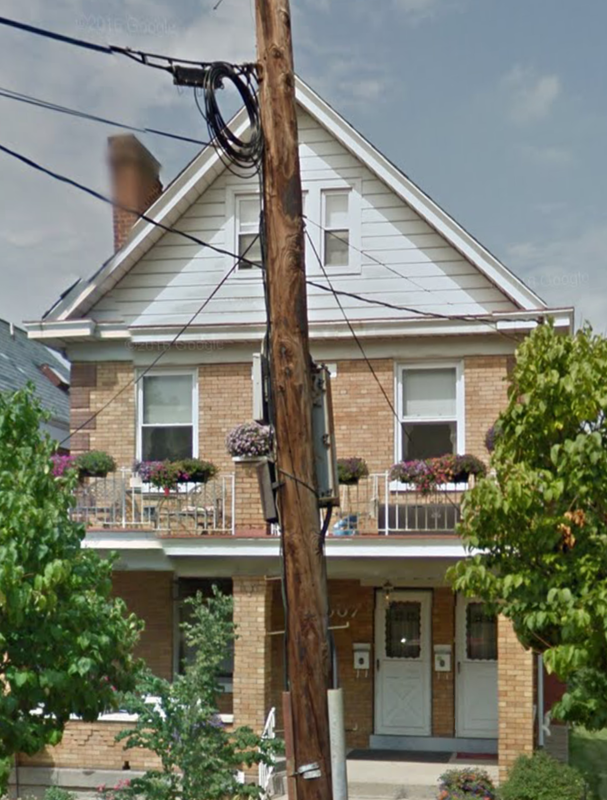 On her application for a marriage license on 23 July 1912, Lillian Hungler stated that she was living at 928 Wells Street, which was the home of her grandparents Michael and Anna (Willard) Cramer. Wells Street was in the East Price Hill neighborhood. She listed her employment as a saleslady. She further indicates that she was 18 on 22 October 1911, which was inaccurate. In fact, she was just 16 on that date. While it is possible she did not know her birth year, it is more likely she put that on the application in order to avoid the issues that came along with being a minor trying to get married. Joseph Kubler, on the same application, was living at 1523 Cutter and his occupation was a conductor. 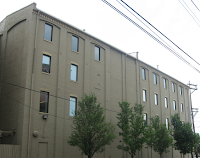 Cutter was located in the Over-the-Rhine neighborhood near downtown Cincinnati. As the city directories show him to be employed as a clerk, it is probable that he was a band conductor as opposed to a conductor on a train. Joseph was quite musically inclined, and involved with musicians throughout the years. 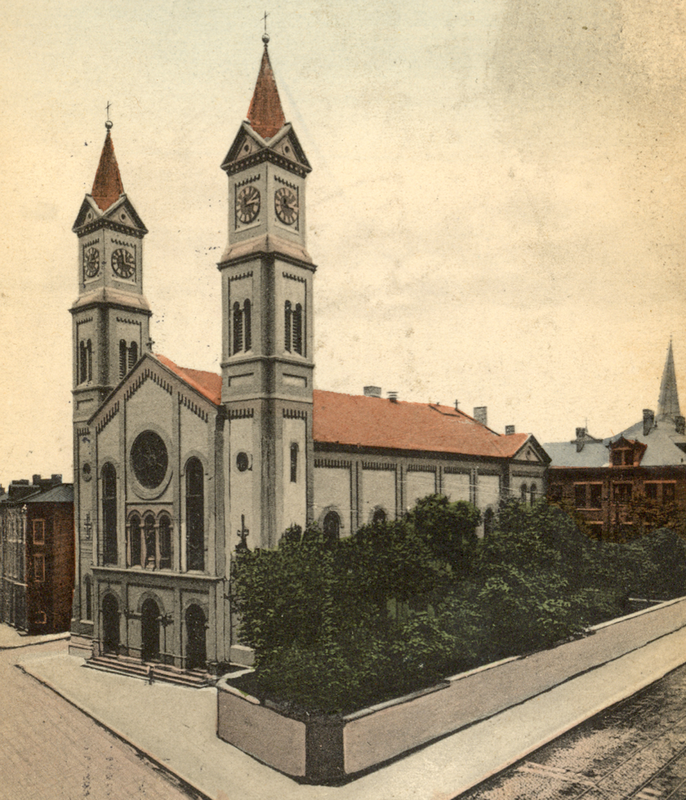 The newlyweds set up their household at 525 David Street in the Over-the-Rhine district, and on 5 September 1913 daughter Ethel joined the family. This child was no doubt named for Joseph's baby sister who died when she was 10 months old. Just one month after the birth of his first child, Joseph lost his mother Louisa. 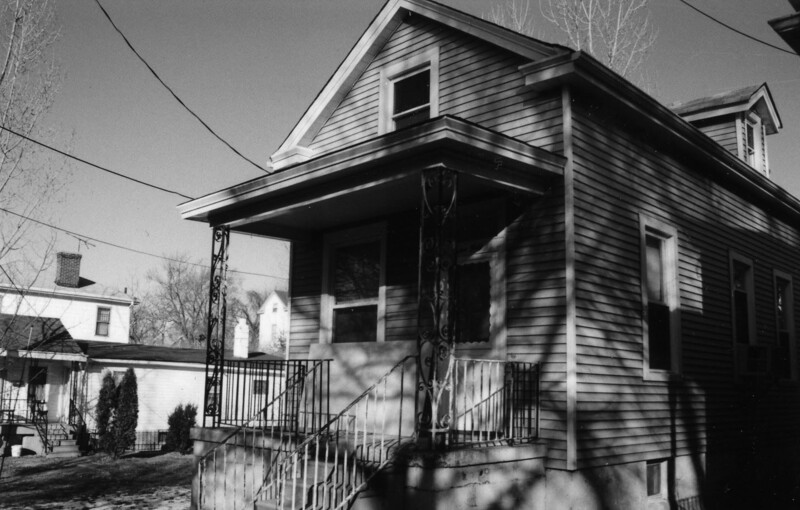 The family stayed in this home for three years before moving to 509 Clinton Street, and during the years on David Street, Joseph was employed as a driver. 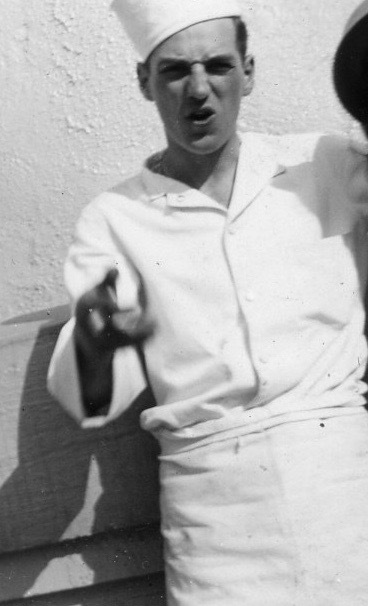 A son, LeRoy, was born on 29 June 1917. By the 1920 census, they lived on 15th Street and Joseph was employed as a traveling salesman in the shoe polish industry. Between 1921-1926, Joseph was an insurance agent. Daughter Mary Jane was born on 10 April 1925, and by the 1930 census the family was on Bauer Street and Joseph was again employed as a salesman, this time for the coffee business. Later that year the baby of the family, Gloria, was born. Like most of America, Cincinnati had its share of problems during the great depression of the 1930s. But other cities did not have to also cope with a major natural disaster at the same time. 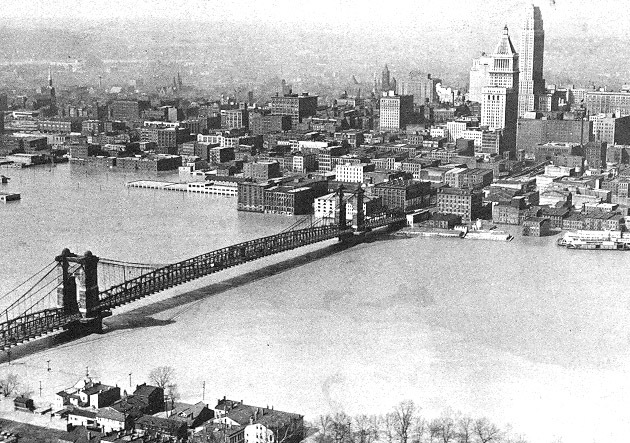 The Cincinnati flood of 1937 was the result of record-breaking rainfall amounts. The Ohio River crested at 79.9 feet. Flood stage for the river is 52 feet. 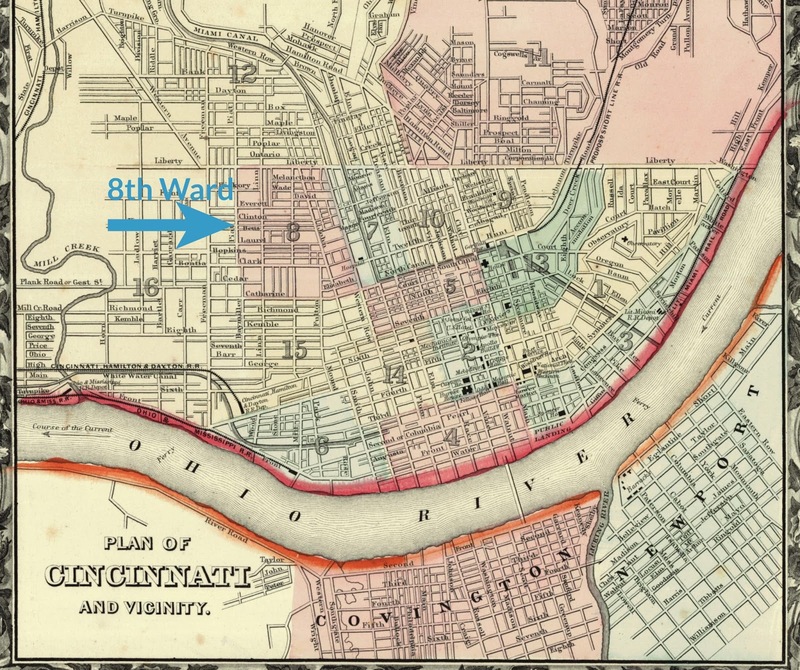 One-fifth of the City of Cincinnati was under water. No matter what Joseph was selling in his job at that time, between the depression and the flood things must have been tight for the family. Fortunately they had moved out of the downtown area to Price Hill by this point, so their home was not impacted by the flood. In the 1940 federal census Joseph was still showing salesman as his occupation. But inside he always had a desire to own his own business. An opportunity came his way when Jim's Pony Keg went up for sale. Somewhat unique to southwestern Ohio, a pony keg was a small store tucked away in a neighborhood that sold beer, wine, tobacco products, pop, candy, chips and other small items. Located at 112 Monitor in the Sayler Park community, Joseph operated a delicatessen in the location as well. He held onto the store until 1965, selling it when he was 74. 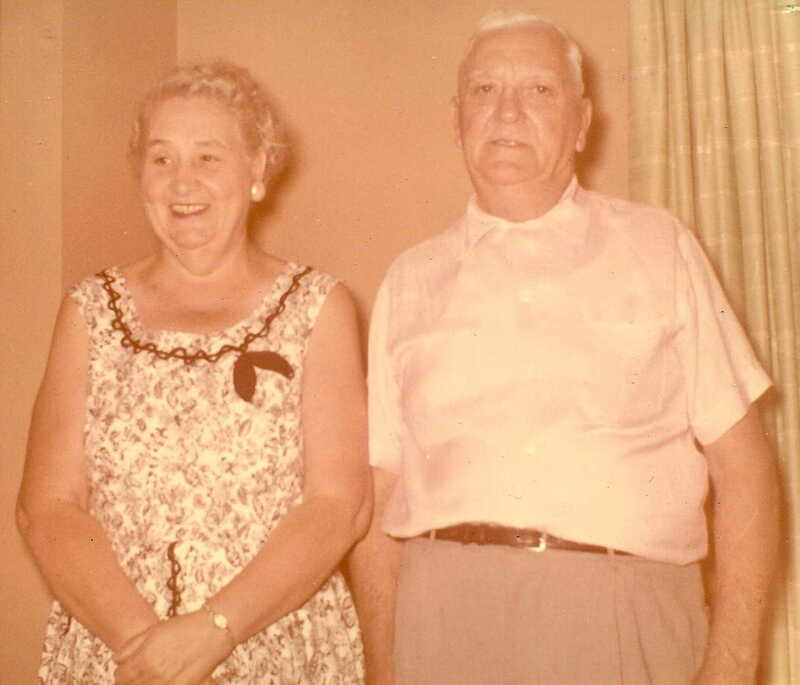 Joseph and Lillian celebrated their 50th wedding anniversary in 1962. Mass was said at St. William Church in Price Hill, and a reception followed in the church hall. All of their children, grandchildren, and many relatives and friends came to congratulate the couple on a momentous milestone in their lives. On 29 June, 1969, his son LeRoy's birthday, Joseph died of congestive heart failure at the age of 77. He had been hospitalized for 5 weeks for the condition. His attending physician was his daughter Mary Jane's husband, Kevin McGann. Joseph's highest education completed was 8th grade, yet throughout his working years he always managed to keep a roof over the head of his family, and food on the table. He was very good with people, which lent itself well to working in sales and ultimately owning his own business. He was greatly mourned when he passed. Note: Joseph's headstone has the incorrect year of birth. He was born in 1891. 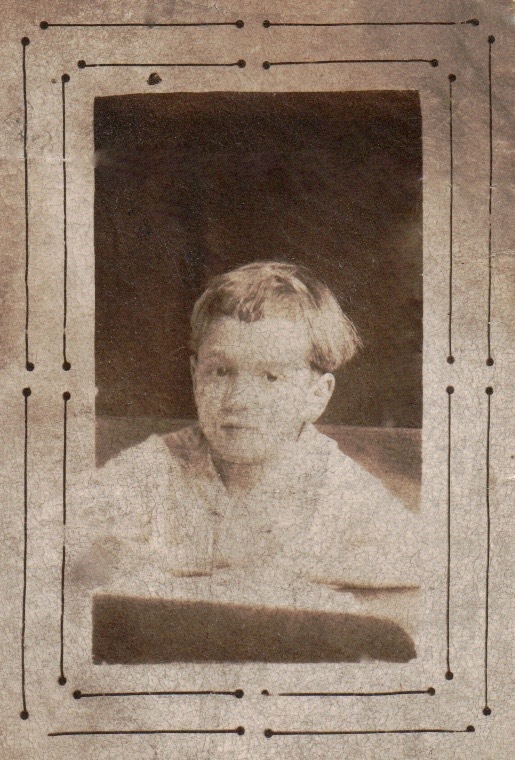 In a previous post, which you can find here, it was revealed that my grandfather Joseph Henry Kubler, lost his father Henry in 1902 when he was only 10. It must have been very difficult for him to face such grief at such a young age. How did he feel when, a year and a half later, his mother married Charles Brinkman? Perhaps he welcomed the half brother who was born when he was 15. 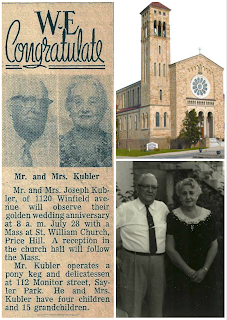 In 1905 when his paternal grandmother, Josephine (Hillenbrand) Kubler died, she left her grandson Joseph $100. Today that is equivalent to around $2,600. Some in the family might have questioned that amount of money as she left a LOT more than that to her three surviving sons. Since Joseph's father Henry had pre-deceased Josephine, it certainly might have been felt that Joseph should have gotten his father's 1/4 share in the estate. In 1910, Joseph was living with his mother, stepfather and half brother in Cincinnati. Joseph was employed as a clerk in a liquor retail house. Apparently he was quite a roller skater when he wasn't working because in 1910 he entered the Ohio Championship, which was a one-mile race at Music Hall Rink in Cincinnati. The race drew amateur skaters from Ohio, Indiana and Kentucky to determine who would be the tri-state champion. 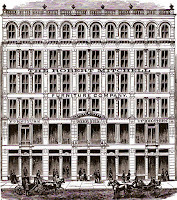 The Cincinnati Music Hall stands at the corner of 14th and Elm Streets, and was opened in 1878. It housed musical activities in the center area, and industrial expositions in its side wings. It was in the north wing that the roller skating race was held. The racers were competing for gold, silver and bronze medals. Two years later, at the age of 21, Joseph was married to 16-year-old Lillian Marie Hungler. 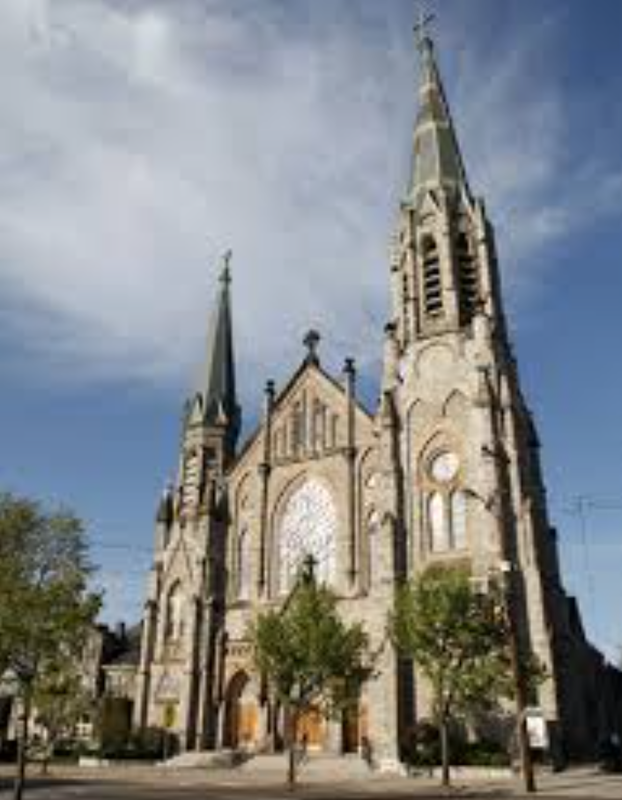 Their wedding took place on 24 July 1912 at St. Lawrence Church. 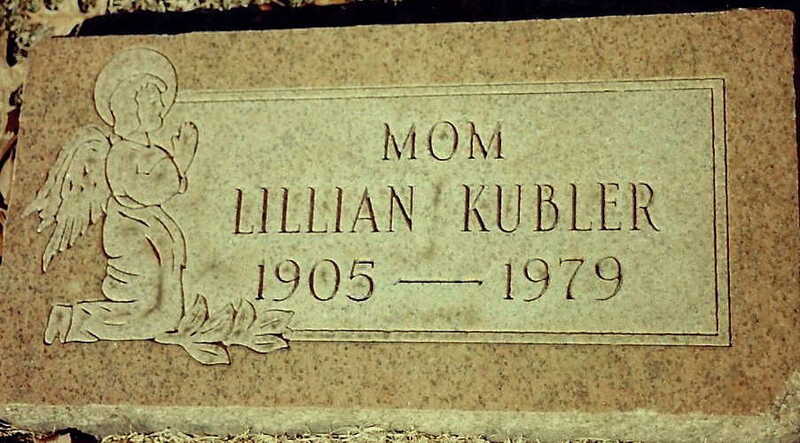 Lillian was born to Albert Hungler and Catherine (Cramer) Hungler in Cincinnati on 22 October 1895. She was the oldest of four children, though only she and her younger sister Alice lived to adulthood. Lillian was 1 when her brother Corry was born, and 2 when twins Alice and Albert came along. Corry died as an infant, and Catherine Hungler lost her battle with tuberculosis on 16 April 1900. She was not yet 23 years old. Albert Hungler found himself a widower at the age of 30 with a 4-year-old and two 3-year-olds to rear. So that he could continue to work as a laborer, he and the children moved in with Catherine's parents, Michael and Anna (Willard) Cramer, where they appear in the 1900 census record. As if the grief of losing Catherine weren't enough for the family to deal with, little Albert died of tuberculosis on 10 October 1900. How devastating this must have been. 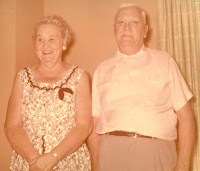 Certainly Joseph and Lillian would have had a lot in common in that they both had lost a parent at a young age, and both of their parents remarried and started second families. Did Lillian marry at such a young age because she was eager to escape the household of her grandparents? The third son of Joseph and Josephine Kubler, John, was 16 when his mother married John Frederick. 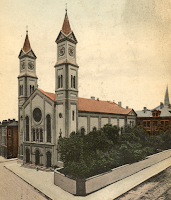 After three publications in the St. Gabriel parish records, Father Rudolf married 23-year-old John and 20-year-old Elenora Michael on 9 September 1896. Elenora was born to Florentine Michael and Mary (Norton) Michael in Indiana on 20 June 1876. She was the youngest of 9 children. 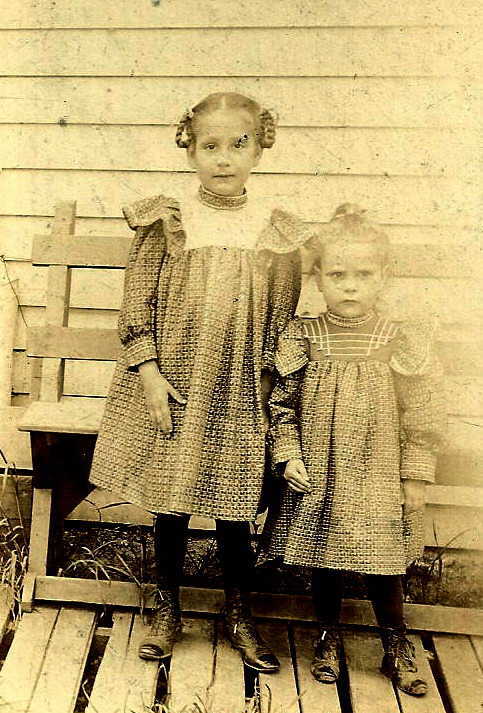 John and Elenora had their first child, Mary, on 27 July 1897 in Connersville. In the 1900 federal census for Indiana, John is the proprietor of a saloon in Connersville. Unlike the other men in his family who were all wood carvers, John took a different path for a career. Perhaps he was inspired by his father during the years when Joseph owned a grocery store. By 1910 he is a merchant in a grocery store. When he completed the World War I Draft Registration Card on 12 September 1918, John indicated that he was blind in both eyes, yet he owned his own grocery. My dad remembered meeting "Uncle Johnny" and visiting him in Connersville. He was amazed the John not only worked, but owned his own business even while blind. That left a life-long impression on him. 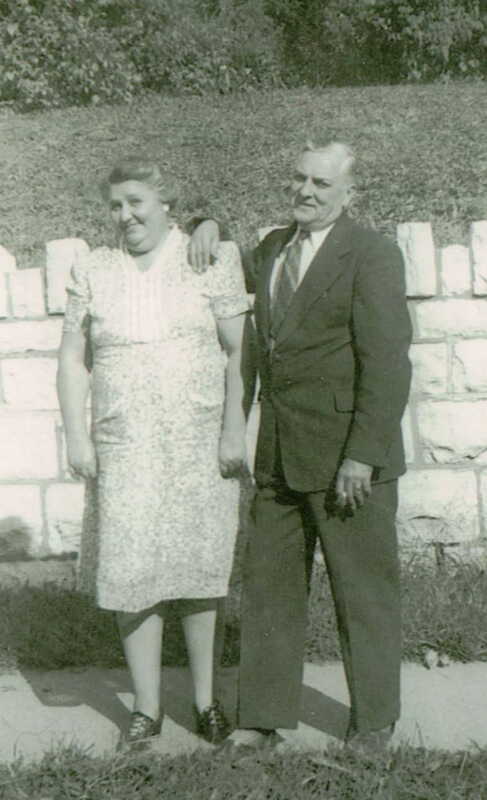 John and Elenora's only child Mary was married to Clarence White on 7 October 1919, and in the 1920 census the newlyweds were living with John and Elenora. John was managing a grocery store, and Clarence was an inspector at an automobile factory. It is interesting to note that between 1905-1941, 13 different kinds of cars were made in Connersville. Elenora died on 13 October 1928 in Connersville. By 1930, John was living with Mary, Clarence and their children. He would spend the rest of his life in this living arrangement. 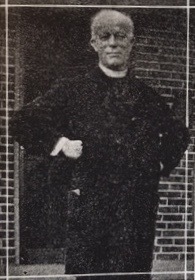 Joseph and Josephine Kubler's second son, William, was 19 when his mother married John Frederick in 1889. William was a wood carver just like his grandfather, father, and brother Henry. On 14 May 1894 he married Nellie Young in Connersville. Their officiant was Father Rudolf of St. Gabriel's Church. A daughter, Pearl, was born 1 August 1895, and a son Leslie on 10 November 1896. 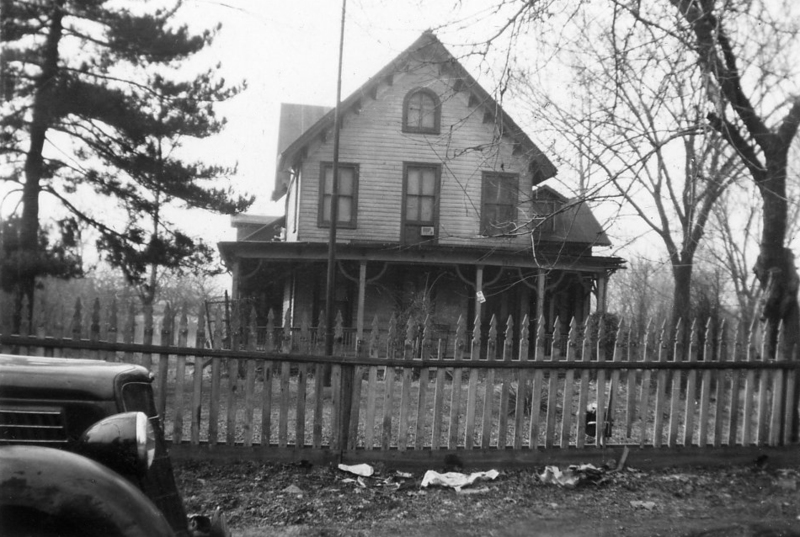 William and Nellie lived in Connersville until at least 1917. By the 1920 federal census they were located in Los Angeles, while their daughter Nellie along with her husband and son were living in Detroit. Son Leslie lived with his sister and her family in Michigan. William worked as a wood carver in a factory. The 1930 census indicated that their 14-year-old grandson William McCormick (daughter Pearl's child) was now living with them in Los Angeles. Pearl was divorced and renting an apartment in San Francisco in the 1930 census. She was employed as a saleslady in a department store. 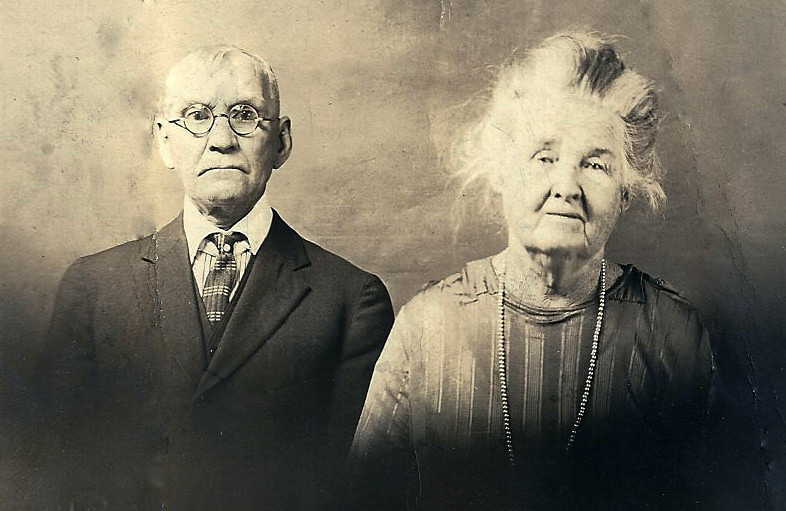 William and Nellie lived the remainder of their lives in California. Nellie died 25 January 1937 in Los Angeles. She was 62. She is buried in Roosevelt Memorial Park Cemetery. William lived to the age of 73, passing on 27 November 1843 in Contra Costa, California. 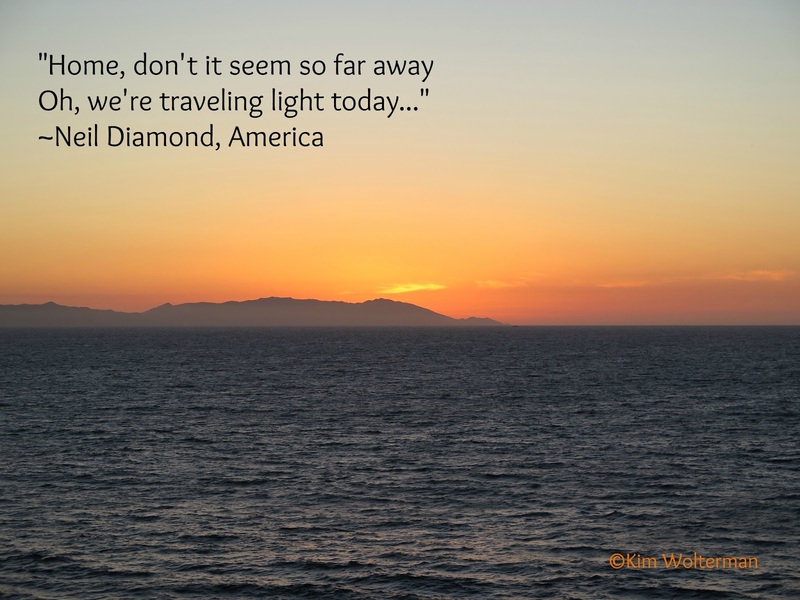 He was still living in Los Angeles when he was 71, but perhaps he moved to the San Francisco area to be close to his daughter Pearl as he neared the end of his life. At the age of 22, four years after the death of his father Joseph, Henry Kubler (my great-grandfather) married 20-year-old Louisa Boegel. 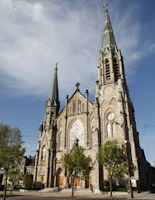 On 18 January 1891, Father Rudolph joined the couple in Holy Matrimony at St. Gabriel's Church in Connersville. The priest offered a "dispensation from the impediment of mixed religion", as the bride was not Catholic. Louisa was born in Cincinnati in July of 1871 to Johann Boegel and Sophie (Suhre) Boegel, who were both from Westfalen, Prussia. Louisa was the 4th of 7 children born to Johann and Sophie. Louisa was employed as a tailoress in Cincinnati when she and Henry met. It would be interesting to know how they met as Henry was working as a wood carver - a trade he no doubt learned from his father - in Connersville. He and Louisa not only married in Connersville, but they also set up their household in that community of around 4,500 people. Perhaps it was because Louisa was expecting when they got married. Their son Joseph Henry Kubler was born in Connersville on 22 July 1891. He was joined in August of 1894 by a sister named Ethel. Unfortunately, Ethel died on 3 June 1895 in Indianapolis. Later in 1895 the family of 3 had settled in Cincinnati. 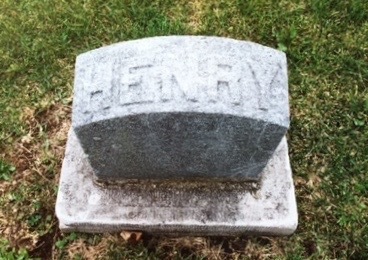 His mother was married to her second husband and had a small child, so Henry must have felt comfortable leaving her behind. His two brothers were still in the area to look after her in the case she needed anything. Henry continued his occupation as a wood carver in Cincinnati, and then became a painter. Louisa was again working as a tailoress. On 11 February 1902, Henry died of an abscess of lung complicated by lobar pneumonia. He was just 34 years old. His burial preparations were handled by a funeral home in Connersville, and he was buried at City Cemetery there in the Kubler plot alongside his father and younger brother Alfred. At the age of 31, Louisa found herself a widow with a 10-year-old son to care for on her own. It wasn't long before she found a help-mate in Charles Brinkman, and they were married on 9 November 1903 in Cincinnati. A son, Charles, was born to the couple on 6 January 1907. Born on the 14th of March 1848 in Büsserach, Vinzenz Josef Kubler (my 2nd great-grandfather) was the fourth and final child of Vinzenz and Carolina. Of the family, he seemed to be the one with wanderlust. As a young man Joseph, as he was known, was making a living as a wood carver in Louisville, Kentucky. In light of the fact that the country was involved in the Civil War, it is curious that he would have chosen to move further south out of Ohio. There is a record of a Joseph Kubler serving as a Union Private in the 7th Regiment, Ohio Infantry so it is possible that he was in the military and that is what took him to Kentucky. On the 26 of November 1867 he married Josephine Hillenbrand at the office of a Justice of the Peace in Louisville. One of the witnesses was Josephine's brother, William. Joseph was 19 and Josephine was only 15. It would soon become evident that Josephine was expecting a child when they were joined in matrimony. Josephine was from Ripley County, Indiana. The 7th child of Wilhelmus and Maria Barbara (Schantz) Hillenbrand, she was born in May of 1852. She lost her mother at the age of 2. Maria died in 1854 at the age of 38, within months of giving birth to twin girls. Wilhelmus Hillenbrand was left to raise 9 children on his own, although the oldest children were no doubt of great assistance to him. Sadly, he passed just 6 years later. Josephine was 9 at the time. With both of her parents deceased, perhaps her older brother William had to give his approval for her to marry. Or maybe he carried a shotgun to the wedding because Josephine was pregnant. It is a mystery as to how she came to be in Louisville in the first place. The rest of the Hillenbrand family had remained in the Ripley County, Indiana area. Joseph and Josephine's first child Henry was born in Louisville in May of 1868. Josephine became a mother at the age of 16. Joseph was employed as a wood carver for Greve, Buhrlage & Co., a fine furniture company. 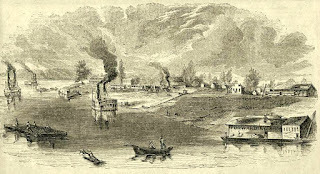 Following the end of the Civil War in 1865, Louisville entered a period of growth with an increase in manufacturing and the establishment of new factories. This growth attracted rural workers from the south as well as immigrants. The new little family did not stay in Louisville for very long, however. In 1860, the population of Cincinnati was just over 161,000 people. Due to its location at the confluence of three major tributaries to the Ohio River, it was a regional center for river trade. 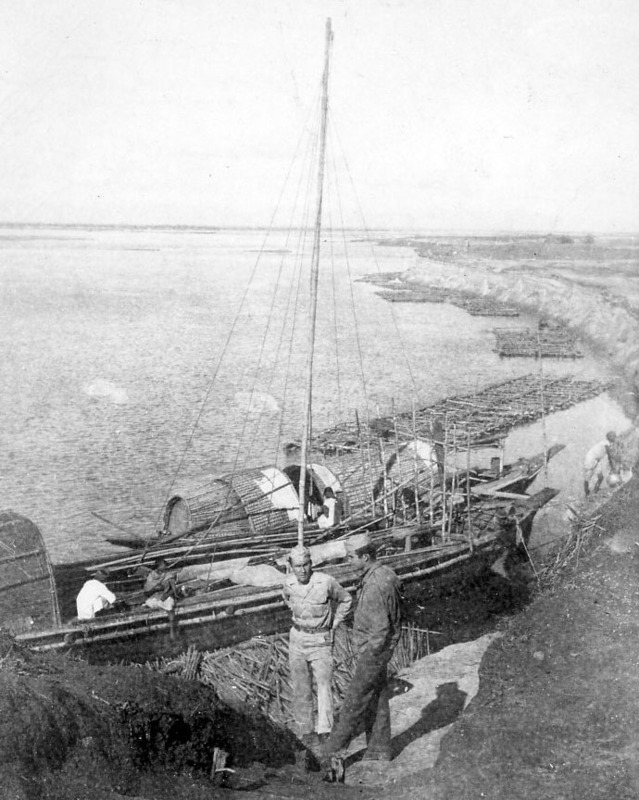 Surplus pork, wheat, corn and other agricultural products were transported by boat to New Orleans. During the nation's expansion, there was a lack of furniture being shipped westward. 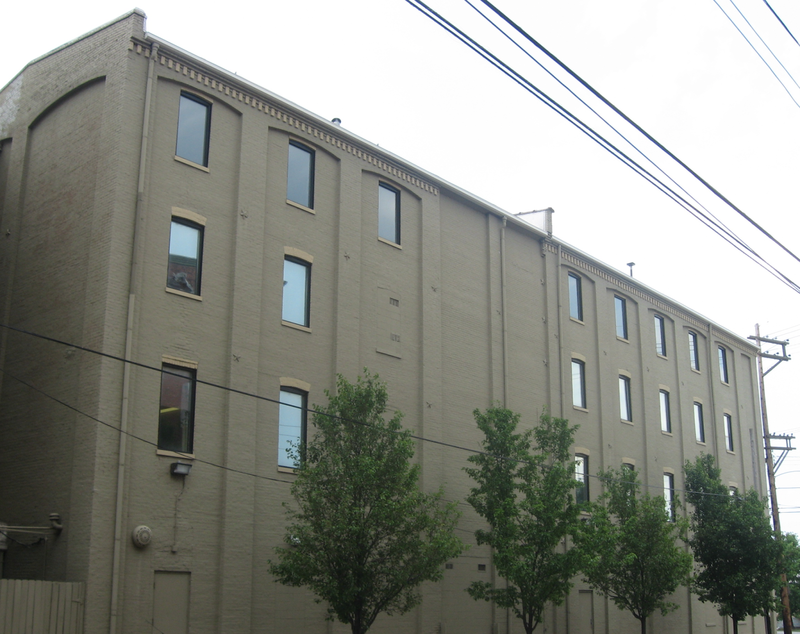 Seeing an opportunity, furniture making became one of Cincinnati's earliest industries. Dense forests in the area provided a constant supply of wood, and saw mills flourished. 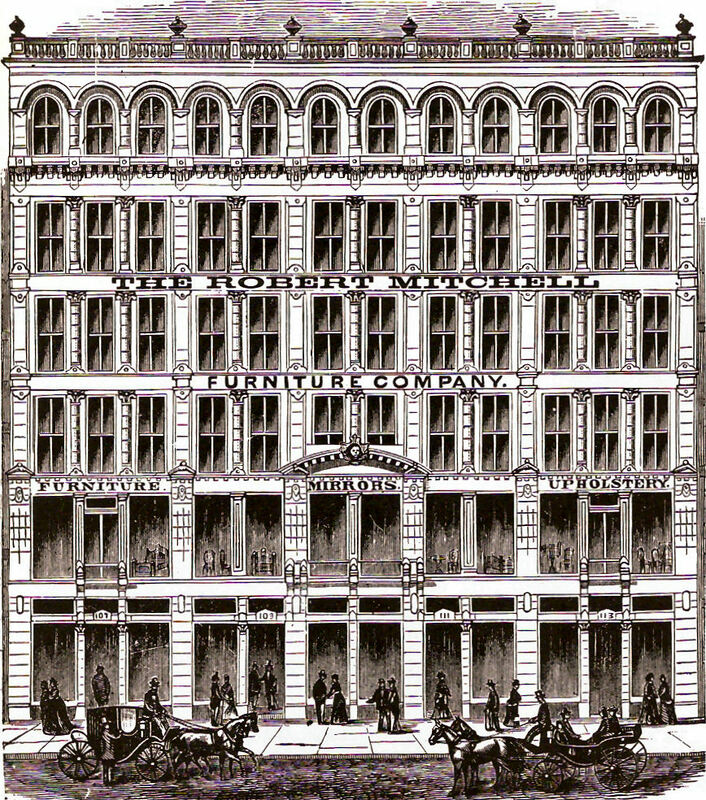 In the 1860 Cincinnati Directory, there were no fewer than 19 furniture manufacturers listed. It is no wonder, then, that Joseph and his sons were able to find work in this industry. The last mention of Joseph in a Cincinnati Directory was 1878, where he is listed as being in a Home for the Aged. To date, I have found no census records for Joseph and his wife Caroline other than the one in 1860. They do not appear on any later census records with their children either. There also are no death records that have been located on either one of them, so we'll pick up the story with their children. The oldest child, Urs Viktor, was born on 1 September 1842 in Büsserach. He would have been 12 when the family emigrated in 1854. What is interesting is that beginning with the 1910 census, he indicates that he was naturalized in 1850. In the 1920 census he says that he come to this country in 1847, and was naturalized in 1850. As a child, he could not have applied for naturalization. If Joseph was naturalized, then his wife Caroline and all four children automatically became naturalized citizens as well. However, an immigrant had to be in the country for five years before application could be made, so these numbers just don't add up. 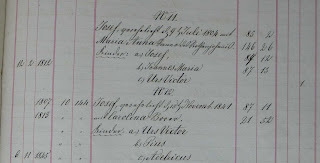 The Canton Solothurn Passport register clearly shows that Joseph purchased passports for himself and his four children in 1854. So did the family really leave in 1847, and then go back to Switzerland? If so, did they have to secure passports to leave again in 1854? This certainly bears additional scrutiny. Locating Joseph's naturalization papers would be very helpful, as these would state when he first arrived in America. Urs Viktor went by the name of Victor Kuebler in Cincinnati. He was employed as a cabinet maker when he married Mary Neiheisel on 19 February 1868. Mary was born 15 August 1847 in Hamilton County, Ohio to Phillip Neiheisel and Barbara (Oliger) Neiheisel. Victor and Mary had the following children: Stella born in 1868; Joseph born in 1871; Sylvester born in 1873; Rosa born in 1876; and George born in 1880. In the early part of his career, Victor worked as a cabinet maker and chair maker, even becoming a chair factory foreman. In later years he was a machinist and pattern maker. His wife died 26 December 1892 at the age of 45, and he later moved in with his daughter Rosa and her husband. Victor died on 28 November 1926. He was 84 years old. The lyrics from Neil Diamond's song "America" seem to be torn right out of the minds and hearts of the immigrants who came to the United States seeking a better life for their families. They brought their dreams, seeking the light of freedom being offered here. Many of them came to parts of this country where other family members or neighbors had settled. Others sought out the parts of America that in geography reminded them of their homeland. In the first half of the nineteenth century, large numbers of Swiss immigrants settled in the rural Midwest, particularly Ohio, Indiana, Illinois and Wisconsin. Cincinnati, Chicago and St. Louis were popular destinations. Immigrants who entered the United States through the port of New Orleans could take a riverboat up the Mississippi River to reach their final destination. German-speaking immigrants continued to come to Ohio in large numbers after 1850, and set the cultural tone for many communities throughout the state. During the 1800s, they were the largest group of immigrants in Ohio. Cincinnati, in particular, was strongly influenced by its German population. If the Kübler family arrived at New Orleans after they left Switzerland, then it is possible that they traveled by steamboat up the Mississippi River to the area that is now known as Cairo, Illinois. 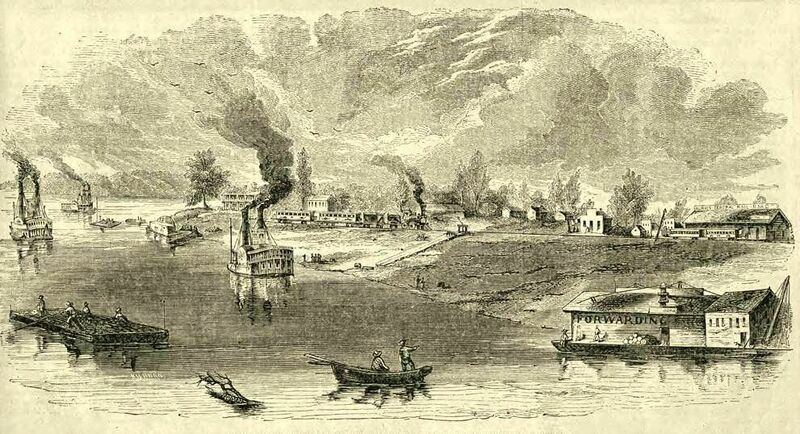 Though Cairo wasn't officially founded until 1858, there was a small settlement in this area at the confluence of the Mississippi and Ohio Rivers. From this confluence, the steamboats could continue their journey up either river, and the Küblers could have traveled up the Ohio River to Cincinnati. The first physical evidence of the Kübler family in the United States comes in the way of the 1860 federal census. Enumerated on the 6th of June, Vinzenz is now known as Joseph and lists his wife Caroline and sons John, Adloch and Joseph in the household. 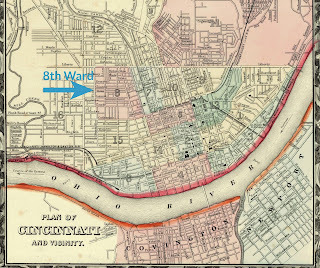 The family lived in the 8th ward of the city of Cincinnati. Names in census records are often spelled incorrectly, and many immigrants anglicized their names in their new country. 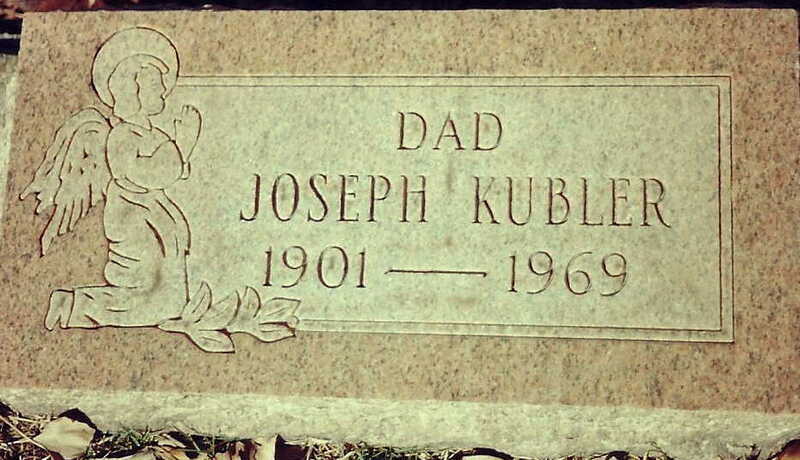 The umlaut was dropped from the last name, though some of the descendants would later spell their last name Kuebler instead of Kubler. The ages of the inhabitants of this house match the family. Joseph Kubler is employed as a chair maker, and his oldest son John is an apprentice in the same trade. The family, from all appearances, was settling into life in Cincinnati. Generally when a Swiss citizen applied for a passport in the 1800s, it meant that they would soon be leaving the country. As Vinzenz made his application in February of 1854, it is assumed that he sought passage to America that year. From a death notice of Joseph Kübler, son of Vinzenz and Carolina, it is mentioned that the family entered the United States through the port of New Orleans. As the notice also contained an incorrect birth year for Joseph, and stated that he came to the United States in 1852, the accuracy of entry to the country via New Orleans is suspect. Many of the passenger records from New Orleans have been lost or destroyed, so to date a listing of the family has not been located, despite looking at surviving records from 1850-1859. However, if the family did indeed arrive through New Orleans, then it is possible that they sailed from the port of Le Havre in France. The distance from Büsserach to Le Havre is less than what the family would have needed to travel to sail out of the ports in Bremen or Hamburg, Germany. Even then, the distance they would have traveled to Le Havre exceeded 476 miles. The train system in France, particularly in the eastern part of the country, was not fully developed. The family would also have had the choice of traveling 506 miles to the port of Bremen, or 521 miles to the port of Hamburg. Even with the more advanced rail system in Germany, it would not have been an easy or direct trip for them. Most likely they would have traveled with just their clothes and perhaps a cherished personal item such as a bible due to the limited amount of space they would be allowed on the ship. Vinzenz and the rest of the Küblers would have told their families and friends good-bye, knowing they would most likely not see them again. Perhaps they took one last walk around the village to bid farewell to the only life they had ever known. Once they arrived at their port of call, it might have been days or weeks before their scheduled ship arrived in port. In the meantime, emigrants were subjected to physical exams, including eye exams, to ascertain if they were fit for the voyage. Until the 1860s the majority of the ships were sailing ships. Many immigrants sailed on packet ships, which were vessels designed to carry mail, cargo and people. (Even when steamships began to accommodate passengers, many immigrants traveled by sailing ships due to the differences in cost.) It would have taken over a month for the immigrants to travel from Europe to America. If the Küblers traveled from Le Havre, the cost would have been around 80-100 Swiss francs, depending on the number of passengers on the ship. Food could be purchased separately for around 40 Swiss francs, and might have consisted of biscuits, flour, butter, ham, salt, potatoes and vinegar. The steerage passengers would then prepare their own meals. The Kübler family would have also had the additional expense of transportation to Le Havre, which might have run about 60 Swiss francs. Of course, all of this is assuming the emigrants enlisted the aid of a reputable company. An unscrupulous one would result in extremely poor conditions on board the ship, along with insufficient provisions. The passengers in steerage slept in narrow, closely packed bunks below deck. The cramped living quarters meant there was little privacy, and illnesses were easily spread. In nice weather, they might have been allowed to go up on deck to get some fresh air. In poor weather conditions, they were stuck below. Vinzenz did not bring his mother along when he left Switzerland. Perhaps she was in ill health and unable to make such an arduous journey. Whatever the reason, it must have broken Maria Anna's heart to lose her final son and his family - this time to a new world. 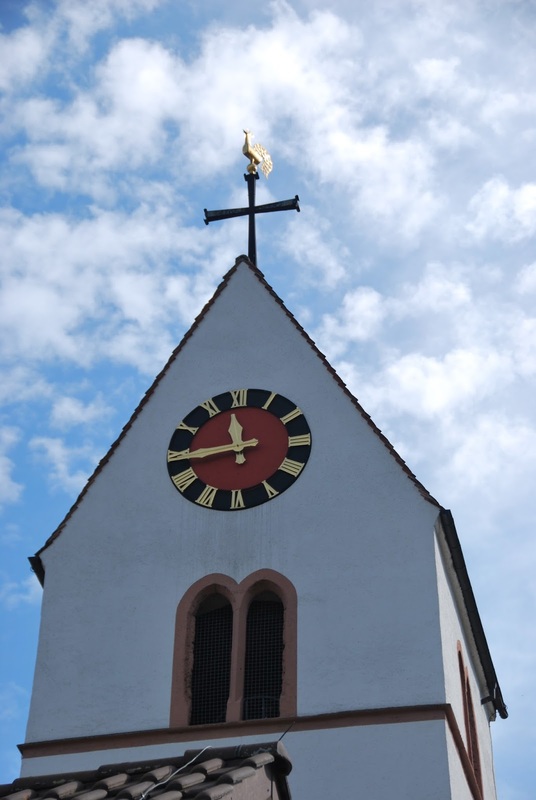 Meanwhile, she remained in Büsserach where she would live the rest of her life in one room of the house that had once been hers. Swiss law was such that when a home was sold, the widow was allowed to remain there in a designated room until she died. Did she know the family that purchased the farm? Was it awkward to know she was essentially a guest in her own home? While the Kübler family was fortunate to own land in Büsserach, that did not mean life was easy for them. 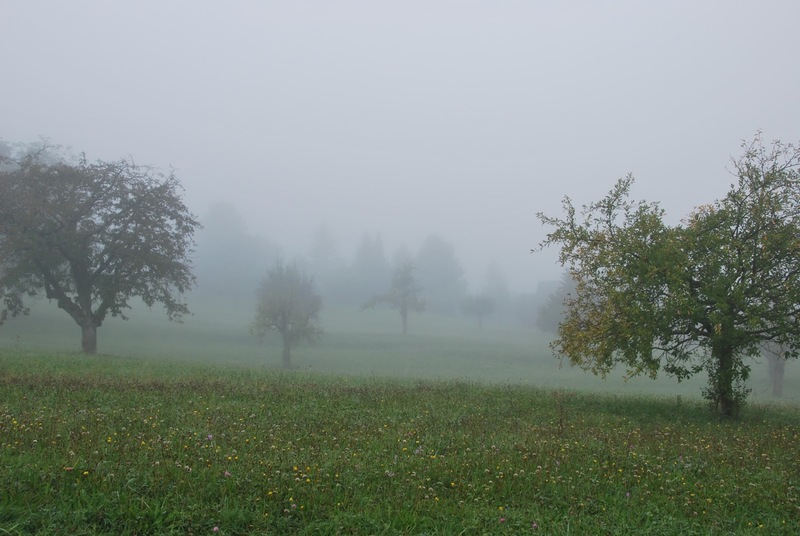 The climate and the soil in that part of Switzerland were not particularly great for agriculture. 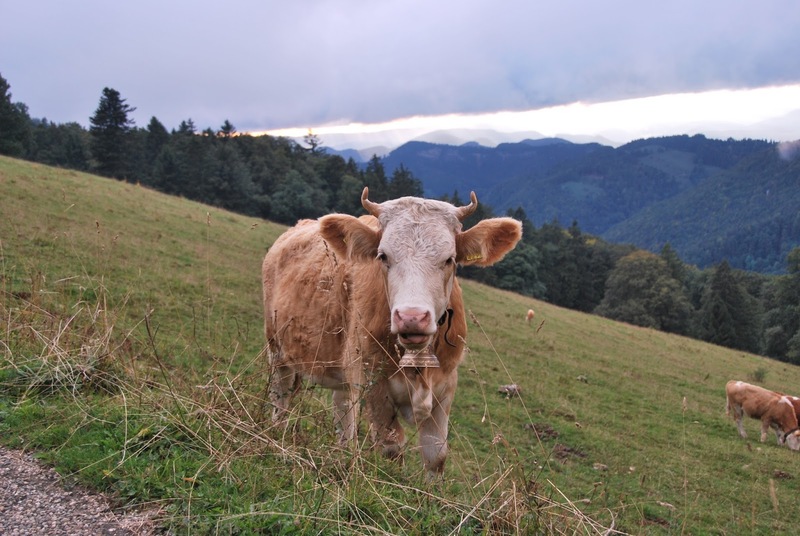 The hills and mountains made it more suitable for cows and goats than growing crops, and there was insufficient land to accommodate a growing population. Perhaps a crop failure in 1853 was the final breaking point for Vinzenz, and the motivation to uproot his family and start all over again in America. He certainly wasn't alone in his thinking. Between 1851-1860, over 25,000 Swiss emigrated to the United States. Generally speaking, it is not the richest inhabitants of any country who seek a home elsewhere. This is particularly true in Switzerland, where the love of country is so strong that only absolute necessity could tempt people to leave their native villages. The majority of the emigrants came from the agricultural cantons. They often traveled with groups coming out of their same region. In some areas the local council gave them a financial incentive to leave so they would have less citizens to feed during times of economic recession. The money was given to the emigrants on the condition that they never return to Europe, and with the caveat that if they did return, the money was to be repaid with an interest rate calculated on top of it. Advertisements were placed in Swiss newspapers by travel agencies who catered to the demand for emigration. Some were reputable, and some took advantage of the poor Swiss who were enticed by the offers of cheap and fertile lands in America, or the opportunity for higher wages and better opportunities for work. The agencies of ill repute were referred to as Seelenverkäufer and Bauernfänger (soul-sellers and peasant-catchers). Eventually the Swiss government stepped in to supervise the travel agencies in an effort to protect its citizens. Whatever his motivation, on 8 February 1854 Vinzenz applied for a passport to America. 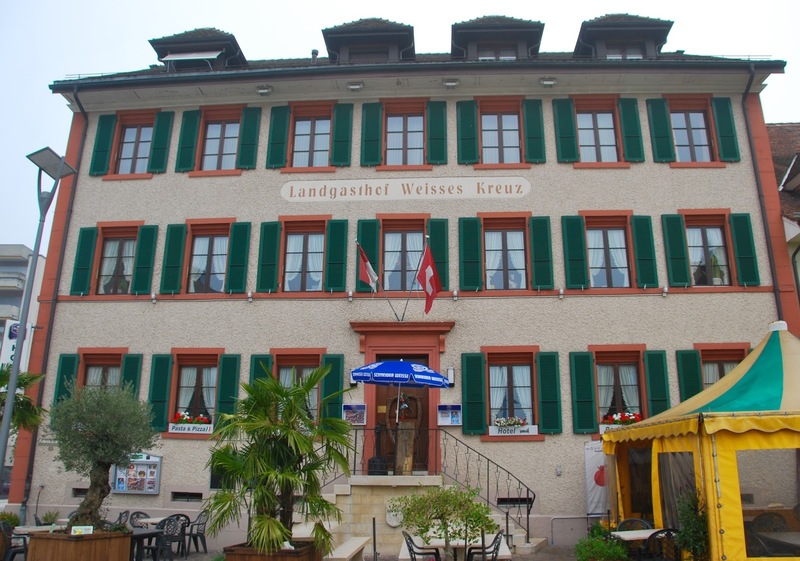 He had sold his part of the family farm, conducting the deal at the very building pictured below which was located in nearby Breitenbach. The sale is how he financed the trip for his family. Using the name of Josef Kübler, the passport indicates that he was from Büsserach and was 41 years of age, 5'7" tall, with black hair, grey eyes and an oval face. It states that he was a farmer and would be traveling to America with 4 children. It is notable that his wife Carolina is not included on the passport. There is no death record for her in Büsserach, and in fact she appears in records in America. It's possible that there was an oversight, or perhaps she traveled at a later time period. Where did the family go? And what was to become of Vinzenz's mother, Maria Anna? Life continued on at a steady pace for the Küblers on their farm in Büsserach. Through the efforts of the Congress of Vienna, which met in Vienna from 1814-15 following the Napoleonic wars, the borders of Switzerland and its neutrality were established. One thing that Maria Anna (Saner) Kübler did not have to worry about was sending her boys off to war. But just because they were not soldiers did not mean she was safe from losing them, however. On 23 August 1833, her youngest son Usus Victor died. He was just 18 years old. Of her 5 children, only 2 remained. A family of 6 had become a family of 3. It must have been a relief and joy to her when her remaining two boys Vinzenz and Johannes were married and began having families of their own. On 15 November 1841, Vinzenz married Carolina Borer. Also from Büsserach, Carolina was born 10 February 1814 to Urs Borer and Maria (Saner) Borer. It is unknown if she had any siblings. Vinzenz and Carolina had the following children: Urs Viktor, born 1 September 1842; Pius, born 17 April 1844; Adelrich, born 6 December 1845; and Vinzenz Josef, born 14 March 1848. 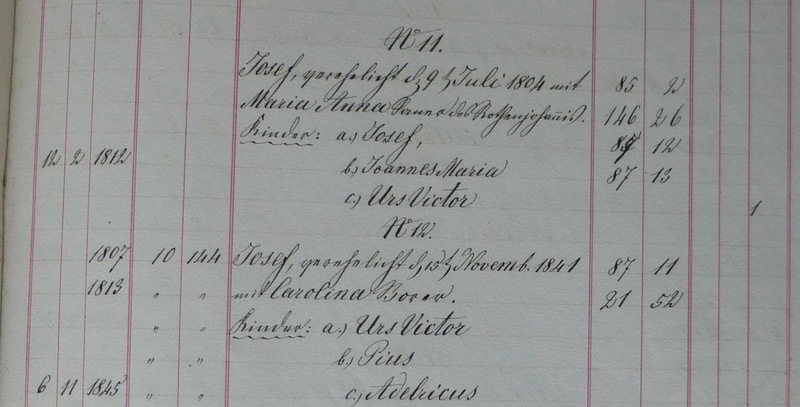 The marriage date of Johannes and Maria Elisabetha Antonia Magdalena Saner is unknown. From their union in Büsserach came two sons: Adolf, born in 1845; and Adelheid, born 21 February 1849. 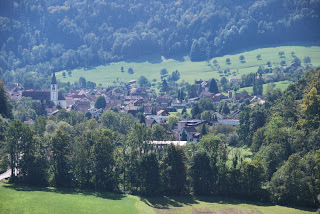 As their two children were born in Solothurn, it is quite probable that Johannes and Maria left Büsserach and set up their household elsewhere. Vinzenz and his family continued to live on the farm with his mother Carolina until 1854. Something happened early that year that would change the lives of Vinzenz, his family, and future Kübler family members as well.